Summit Lake Mysteries (in Alpine County, CA) . . . Photographer John Calvin Scripture captured this haunting image of a mysterious lake about 1874. The hand-lettered caption calls it “Summit Lake,” and confirms the location as Alpine County, California. So where was this 140+ year-old picture taken? There is, of course, a “Summit Lake” in Alpine County not far from today’s tiny airport, and another (on some maps, at least) in the wilds southeast of Blue Lakes. But neither lake a likely match for the one captured by Scripture in his old photo. So where was the lake in this 1874 photo taken? Ah, and that turned into a hunt to solve not one but two mysteries! 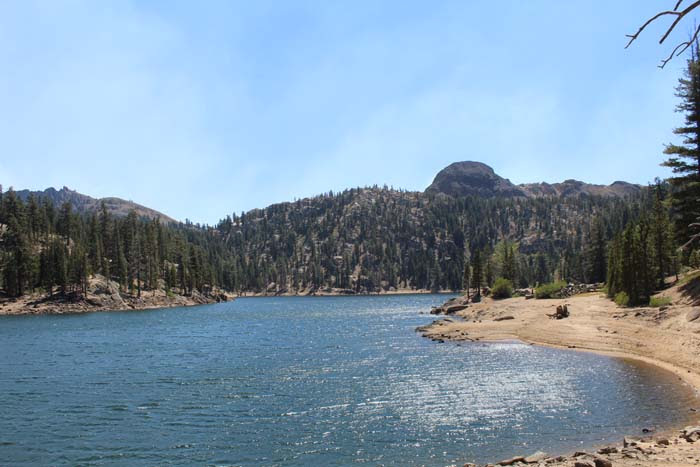 We put our heads together with noted Sierra historian Frank Tortorich, who tendered Mosquito Lake as a possibility: a small lake near the crest of Pacific Grade, on today’s Highway 4. That would indeed make it a true “summit” lake! And its location along Highway 4 — once the old Big Tree Road — makes it a great fit for Scripture’s “Big Trees” series. Check out these images — Mosquito Lake sure looks like a match to us! Scripture’s “Summit Lake” in 1874. . . and Mosquito Lake today. So our first “Summit Lake” mystery — apparently solved! But, as we were researching, we found a second Summit Lake image that posed even more of a challenge! This one’s an 1861 sketch by Edward Vischer, a Bavarian artist who traveled widely in early California and Nevada. It’s officially titled: “Lake near the summit of the East Range, on the Big Tree Road,” and was printed several years later in Vischer’s book, Pictorial of California Landscape, Trees and Forest Scenes. 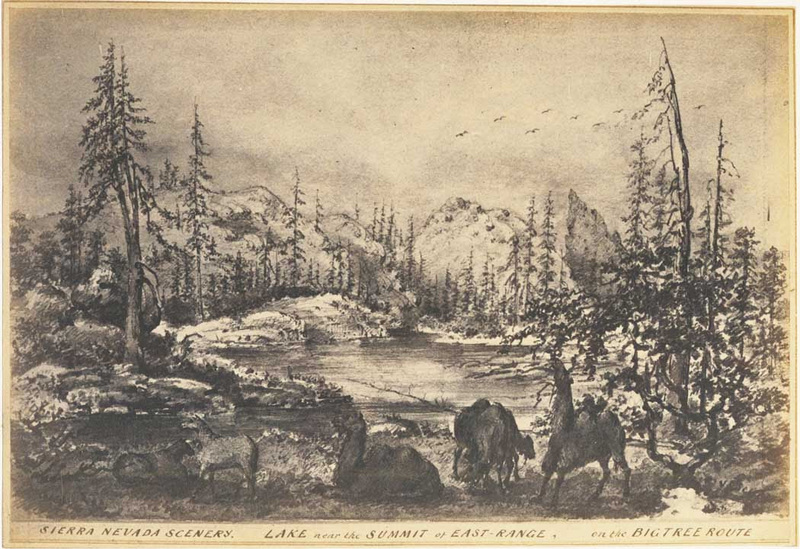 The Vischer sketch of another Summit Lake, also on the Big Tree Road, captured in 1861. And take a close look — those are camels in the foreground! The caption to the Vischer sketch confirms that this “Summit Lake” also was somewhere along the Big Tree Road. But it’s clearly not the same lake as Scripture’s photo. Vischer’s rocky cliffs more nearly resemble the outcrops near today’s Kinney Reservoir. And that would certainly fit as a “summit” lake on the East Range; Kinney is near the top of Ebbett’s Pass, an easterly sister to Mosquito Lake on nearby Pacific Summit. Perhaps the camels were taking an afternoon snooze beside the (smaller) original lake that morphed into Kinney Reservoir once the dam went in. On first glance at least, that looked like a good guess! Check out this photo of Kinney Reservoir today. Kinney Reservoir (holding much more water than the early original natural lake, thanks to today’s dam). Nearby Lower Kinney Lake is another possible match. Only one big problem with the Kinney Lake theory: there was no actual road over Ebbett’s Pass (and Kinney Lakes) in 1861 — just a rough pack trail. The trail was improved into a wagon road three years later, an extension of the Big Tree Road to serve Silver Mountain City. But the good wagon road wasn’t finished until 1864. Map of the Big Tree Road (yellow dotted line) and the eastward extension over Ebbett’s Pass to Silver Mountain (original map courtesy of Frank Tortorich. Colored annotations and locations of Mosquito Lake and Kinney Lake added). 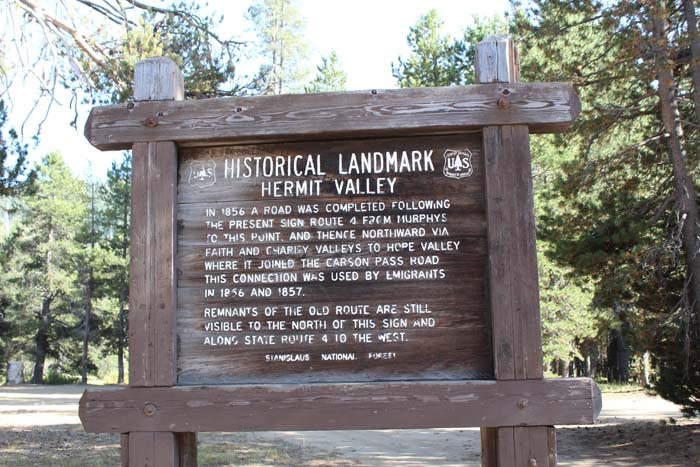 Historical marker at Hermit Valley, where the roads forked. Border Ruffian Pass (leading from Murphy’s to Hope Valley) was opened to wagon traffic in 1856. 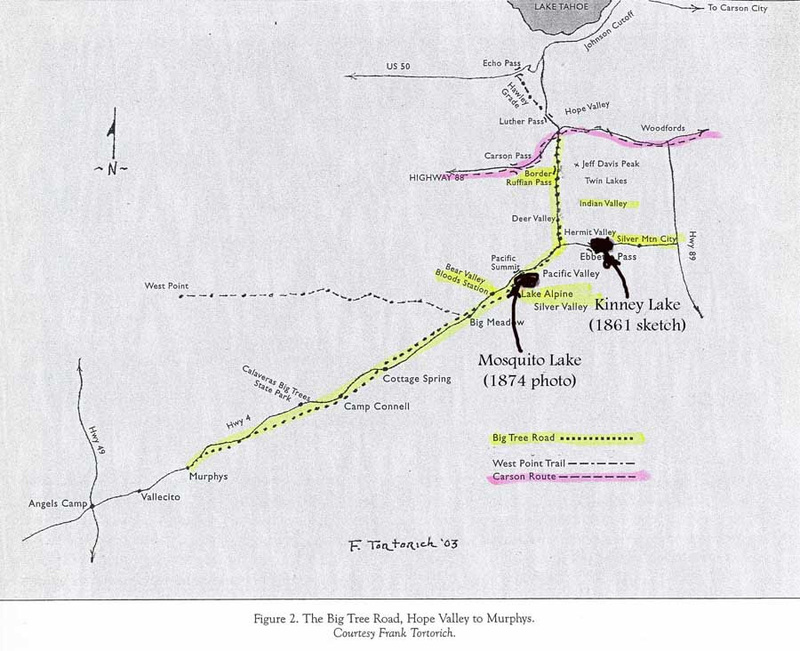 So, would camels have been herded along a mere pack trail to reach the lake at Kinney? Wouldn’t the camel train instead have followed the more-established Border Ruffian wagon road north through Hope Valley, and continued east on the old Carson Emigrant Route? First: The Border Ruffian Road connected with the old Carson Emigrant road, which would have required a steep and rocky descent through Woodfords Canyon — perhaps not such an appealing prospect with camel hooves. And Second: Horses and mules had a tendency to panic at the sight of the unfamiliar camels. Perhaps the camel party preferred the quieter pack trail to the potential chaos of the busier Big Tree wagon road. So, while we don’t know for sure, our bet is that Vischer’s camels were resting near the original small mountain lake that’s now become Kinney Reservoir. Take a look at the photos above, and let us know what you think! 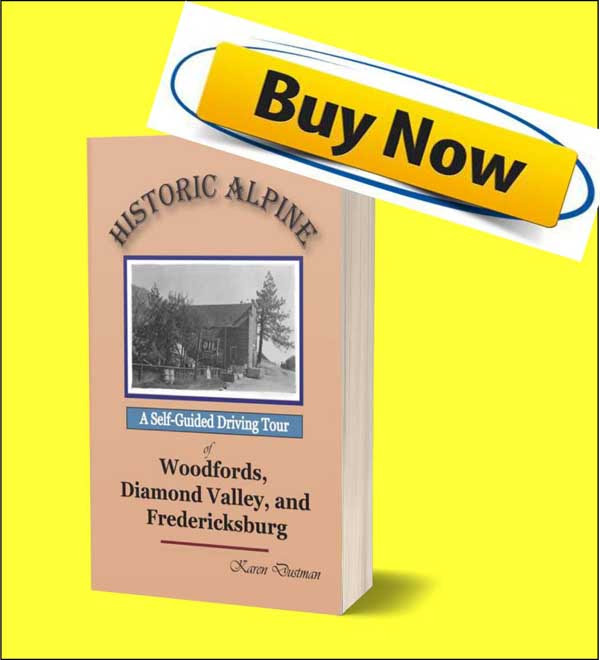 Discover long-forgotten Alpine County sites for yourself: With this guided historic tour of Snowshoe Thompson’s Diamond Valley, early Woodfords, and Fredericksburg’s pioneer ranches! Enjoyed this story? Please share it with your friends! And if you’d like to read more Sierra history stories like this, just sign up for our free history newsletter in the box on this page!